The Alor Archipelago, Indonesia, is a string of volcanic islands including Lembata, Pantar, Pura and Alor. Discover the hidden beauty of these wonderful shallow reef areas in some highest diversity and ‘fishiest’ areas of the Coral Triangle adjacent to Raja Ampat. From the surface we have the chance to see passing pods of pilot whales, dolphins or even a massive blue whale in one of the region’s most important areas for cetaceans. Komodo is the land that time forgot and here in the Komodo National Park, we will encounter the fearsome Komodo dragons in their natural island habitat. 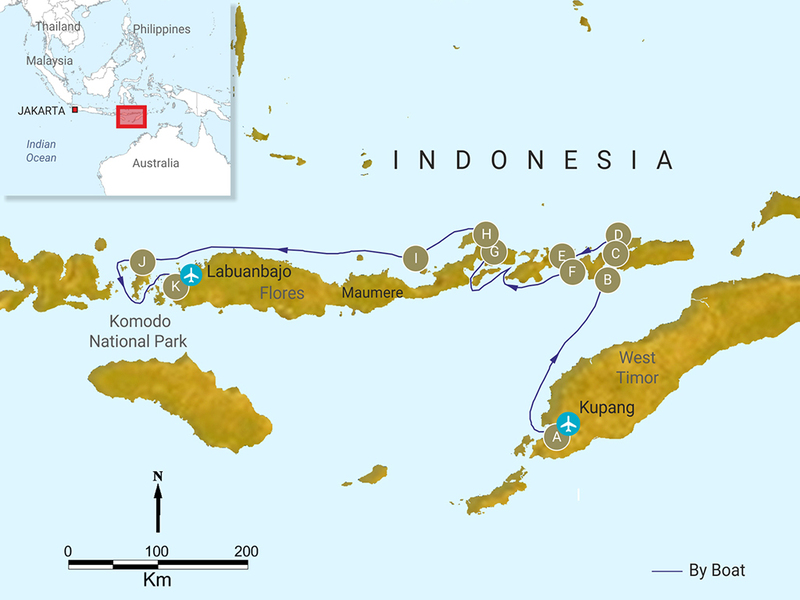 While cruising from Kupang to Komodo we will explore the many islands of this spectacular World Heritage Site, with the opportunity to engage in a whole host of activities such as: visits to remote villages, snorkeling on beautiful coral reefs, searching for giant manta rays, whale and dolphin watching, searching for endemic birds, rare endemic fish and Komodo dragons. This is a purpose-designed snorkeling trip with the idea that finding good snorkeling on a dive site can be frustrating. We are able, however, to offer limited diving to certified guests. There will also be ample time for swimming, as well as simply enjoying the stunning scenery and the pleasure of cruising across the tropical seas on our splendid, traditionally built pinisi ship, the Damai II. Accommodation on a shared or single cabin basis. One Pete Oxford Expeditions trip leader and one Oceanic Society leader. Round trip international airfare to Bali. Internal airfare within Indonesia. We will book these flight & invoice you. Early check-in or late check-out in hotels. Park and harbor fees (US$225.oo pp). Gratuities to the guide and crew. Arrive in Kupang in Indonesian Timor. You will go directly to the Damai ll. After dinner, we will depart on an overnight crossing north while you unpack and set up your dive and snorkel gear as well as your cameras. At dawn you will find yourself in a picturesque bay with numerous children coming to the boat in small canoes to greet their visitors. On the southeast of Pantar Island, Beanabang Bay offers great reef snorkeling of the highest quality. Here we have the chance to search for octopus, ghost pipefish, unusual shrimp, colorful nudibranchs and lots of juvenile fish. We will also interact with local people in their village for those who would like to go ashore. Entering the Pantar Straits from the north, we’ll first snorkel off of the islands of Ternate and Reta. These areas are home to beautiful coral walls filled with both macro and wide angle subjects. Then we’ll head south to Pura Island and the famous “Valley of the Clowns”, a unique experience whre giant anemones carpet the seafloor and colorful reef fish school above. Our day will end in north Pura Island at Pak Jan’s village. This will be your chance to buy traditional woven cloths, called ikat, from the village women who will come out to our boat at both Ternate and Pura. This is truly authentic souvenir shopping with the opportunity to buy these weavings directly from the very hands that make them. This is one of the best snorkel areas in the whole of Indonesia. Upwellings of cold water bring nutrients and the reefs are absolutely full of life: hard corals, soft corals, swim throughs, invertebrates, schooling surgeons, rainbow runners, emperors and occasionally mola mola. While on the horizon the chance to see whales and dolphins… as god as it gets! Our day will begin at the craggy rock called Serbete, where we will snorkel along a wall and sand slope. We’ll then travel on to the west side of the island of Adonara for the afternoon and night snorkels. Get your eyes in tune for hunting out critters and macro life. Here we visit some excellent snorkel sites with possibility to see macro critters and more! The passage between the islands of Solor and Flores has several rocks that reach up from the seabed providing some excellent snorkeling, the locals say that Manta Rays come to this area for cleaning. This is a beautiful area for diving decorated with soft corals and sea fans, whilst its location is ideal for spotting passing cetaceans which might include Sperm or even a massive Blue Whales. Spend the afternoon on critter hunting on the sand slopes off the island of Adonara. Maumere Bay has several excellent walls with schools of Bumphead Parrotfish and Sweetlips cruising the reefs. On the west side of the bay there is a ridge with beautiful white sand and scattered coral heads. Then make yourself comfortable for the trip over the north coast of Flores towards Komodo National Park. There will be time to snorkel in Central Komodo in the current rich areas of Tatawa, the iconic sites of Batu Bolong and the manta dive at Karang Makassar. In the north we have the islands of Gili Lawa with some of the most “fishy” sites in the Park. For a macro experience, head to the small island of Wainilu on the north coast of Rinca. Snorkeling along the sand slope in front of the beach should prove an excellent opportunity for critter hunting and some unusual nudibranchs. This is the gateway to enjoy a walk in the park to view the prehistoric Komodo dragon. You may also see monkeys, water buffalo and wild boar or just enjoy the panoramic views over the park. We will be escorted to the airport in Labuanbajo and assisted with check in procedures, no doubt full of talk about their amazing adventures exploring Alor. Pete is a trained marine zoologist and renowned underwater photographer. He has visited Indonesia many times since he first explored the archipelago as a backpacker and has previously led, or co-led, multiple trips together with the Oceanic Society. He is an ardent conservationist working more and more on marine conservation issues. Pete compares the diversity on the Indonesian reefs to that of the Ecuadorian Amazon, another destination he is particularly familiar with. He is especially excited, on this itinerary, to offer ample interaction with local indigenous tribes. It is a true expedition and although we have a schedule to guide us, we will take every opportunity to maximize our fun. Wayne Sentman has worked as a natural history guide over the last 20 years for the Oceanic Society, a US-based marine conservation non-profit. Currently he serves as their Director of Conservation Travel Programs, where he designs mission driven expeditions that utilizes tourism to support conservation research directed at species and habitat protection, and promotes transformational travel as a means to motivate public behavior changes that enhance conservation goals. He has field experience in the US in Hawaii, and Alaska, and internationally in Micronesia, the Caribbean, Kenya, Suriname, Peru, Tonga, Indonesia, and the North Pacific. For 10 years he assisted and led field conservation research projects monitoring a variety of endangered or protected species. Since 2001 Wayne has also been an instructor for a 3-week undergraduate wildlife ecology field course conducted each year on the Mpala Research Center in Kenya. In 2013 Wayne completed his Master’s degree in Sustainability and Environmental Management at Harvard University. Wayne’s interests include photography, human wildlife conflict resolution, plastic pollution as a mechanism of contaminant exposure in wildlife, and the use of art and digital media to interpret environmental problems to a global audience.